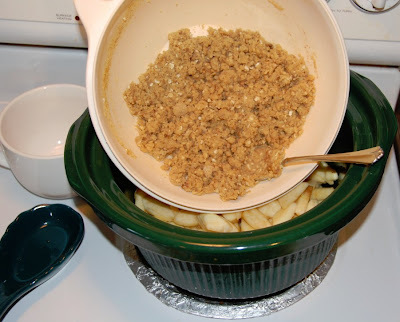 we LOVE this apple crisp recipe i found on a fulltime RVer's blog. i'll summarize here, but he does share funny sleep-talking stories that i SO relate to. we have a sleep talker, a sleep walker, and a sleep yeller. good times. so far i've used butterscotch and custard pudding mixes, and they were great! vanilla is next. Sliced apples are sprinkled with topping made with Oats, Brown Sugar, and Butterscotch Pudding mix, then cooked in a Crock Pot. 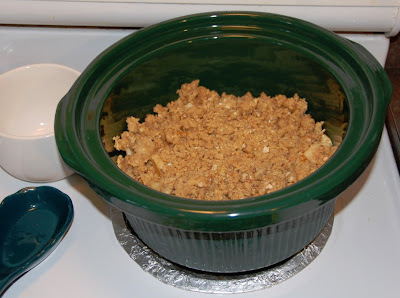 Place apples in a 3-qt crock pot. In a large bowl, combine the Brown Sugar, Flour, Oats, Pudding Mix and Cinnamon. Cut in Butter until mixture resembles course crumbs and sprinkle over apples. Cover and cook on low for 5 to 5 1/2 hours or until Apples are tender. Thank you Lundy's. I have made this three times-it's wonderful and easy. Just purchased three more boxes of butterscotch pudding mix and my list is ready for the farmer's market.